A regular breeding resident and migrant; regular in winter. The American Goldfinch was an abundant species during the Minnesota Breeding Bird Atlas (MNBBA). The American Goldfinch is widely distributed across southern Canada and the northern and central United States. Some of the highest breeding densities occur across the Great Lakes states west into North Dakota and southern Manitoba (Figure 1). Northern populations are short-distance migrants that winter in the southern United States and northern Mexico; southern populations are year-round residents. Some birds are present year-round in Minnesota and are likely permanent residents. Foliage and ground gleaner that feeds exclusively on the seeds of annual plants, primarily composites. Insects are only consumed when encountered foraging for seeds. Open-cup nest located in herbaceous plants, shrubs, or trees; deciduous shrubs are preferred. Breeding distribution and relative abundance of the American Goldfinch in North America based on the federal Breeding Bird Survey, 2011–2015 (Sauer et al. 2017). Over all the varied surface of Minnesota, even far out on the western prairies if there be so much as a vestige of arboreal growth, the Goldfinch is a common and often abundant summer resident. The species could also be seen throughout the winter months in the southern counties and as far north as Anoka. Confirmed nesting records (nests with eggs or young) were available from 10 counties that stretched from the southeastern corner of the state north through the deciduous and mixed forest regions, including Cass, Crow Wing, Fillmore, Goodhue, Hennepin, Houston, Polk, Scott, Sherburne, and St. Louis. Forty years later, Green and Janssen (1975) also commented on the species’ statewide distribution, noting that it was most abundant in the south and least abundant in the heavily forested landscape of northern Minnesota. Janssen (1987) delineated 21 counties where nesting had been confirmed since 1970; Hertzel and Janssen (1998) added an additional 11 counties to the list. Field biologists working with the Minnesota Biological Survey documented a total of 2,303 American Goldfinch breeding season locations as of 2014. Records were widely distributed through all but the state’s most intensively cultivated regions (Minnesota Department of Natural Resources 2016). MNBBA participants reported 5,316 American Goldfinch detections in 61.9% (2,966/4,788) of the surveyed atlas blocks and in 80.2% (1,875/2,338) of the priority blocks. Breeding was confirmed in 262 (5.5%) surveyed blocks (Figures 2 and 3; Table 1). The American Goldfinch was observed in all 87 Minnesota counties and was confirmed breeding in 56 counties. Of these, 34 counties were additions to the list published by Hertzel and Janssen in 1998. Although the species was widespread across the state, it was most evenly distributed in the Tallgrass Aspen Parklands Province and the Eastern Broadleaf Forest Province; it remains less common in portions of southwestern Minnesota and in the far northern regions of northeastern Minnesota. Based on the number of records, the American Goldfinch was the fourteenth most abundant species detected during the atlas. The broad distribution of the American Goldfinch remains unchanged since Roberts (1932) first described it as a statewide resident nearly one hundred years ago. In their comprehensive review of the species, McGraw and Middleton (2009) noted that there had been no major changes to its’ historical North American breeding distribution. The MNBBA predicted distribution model predicts that the likelihood of encountering the American Goldfinch is highest in scattered portions of east-central Minnesota, extending north through the Hardwood Hills and the Pine Moraines and Outwash Plains Subsections. Relatively high breeding densities are also predicted in the west-central counties of Lac qui Parle and Big Stone and further north in northwestern Minnesota (Figure 4). The extensive peatlands of north-central Minnesota and the dense forested landscape in the Arrowhead region are predicted to support the lowest breeding densities. A clear association with riparian floodplains is evident throughout several regions of the state. Breeding distribution of the American Goldfinch in Minnesota based on the Breeding Bird Atlas (2009 – 2013). Summary statistics of observations by breeding status category for the American Goldfinch in Minnesota based on all blocks (each 5 km x 5 km) surveyed during the Breeding Bird Atlas (2009-2013). Summary statistics for the American Goldfinch observations by breeding status category for all blocks and priority blocks (each 5 km x 5 km) surveyed during the Minnesota Breeding Bird Atlas (2009-2013). Predicted breeding distribution (pairs per 40 hectares) of the American Goldfinch in Minnesota based on habitat, landscape context, and climate data gathered during the Minnesota Breeding Bird Atlas (2009-2013) using the General Linear Modeling method with an adjustment for detectability. A species of open country with scattered trees and shrubs, the American Goldfinch is typically associated with old fields, young successional stands, roadsides, riparian floodplains, brushy openings, forest edges, and prairie groves (Figure 5) (Danz et al. 2007; McGraw and Middleton 2009; Bent 1968). The interior of mature forests are avoided, but when forests are cleared for agriculture or small residential areas, the openings provide ideal habitats as long as scattered trees and shrubs are available. The National Forest Bird (NFB) Monitoring Program in northern Minnesota and Wisconsin found that in extensively forested landscapes the American Goldfinch was most strongly associated with small towns (Niemi et al. 2016). One of the common features of any habitat where the species is found is the presence of herbaceous plants of the composite family, especially thistles, the seeds of which are a preferred food item. Thistle plants are also a common nesting site. The cluster of branches growing close together form an ideal little crotch to which the nest can be secured; the spines on all parts of the plant also provide a degree of protection from predators (Pius 1948; Lewis 1952). A study in the 1940s found more than 700 of the species’ nests in a 400 ha site in west St. Paul; the majority (591) were placed in the uppermost cluster of branches of thistle plants, primarily tall thistle (Cirsium altissimum) (Lewis 1952). Habitat data collected within 200 m of MNBBA point counts where the American Goldfinch was detected demonstrate the wide variety of habitats utilized by the species, but the data show a particularly strong association with oak forests and developed lands (Figure 6). The species also was associated with croplands, grasslands, shrubby wetlands, marshes, and a wide variety of other upland and lowland forests. Typical breeding habitat of the American Goldfinch in Minnesota (© Lee A. Pfannmuller). Habitat profile for the American Goldfinch based on habitats within 200 m of point counts where the species was present during the Minnesota Breeding Bird Atlas (2009-2013). Long-term population data collected by the federal Breeding Bird Survey (BBS) have been used to generate a North American population estimate of 43 million breeding adults (Rosenberg et al. 2016). The statewide estimate for Minnesota was 2 million birds, or 4.8% of the continental population, in 2013 (Partners in Flight Science Committee 2013). Because the MNBBA point count data provide more intensive statewide coverage over a shorter period of time, these data were used to test the BBS-derived estimates and generated a significantly larger statewide estimate of 4.4 million birds (95% confidence interval of 3.9 – 4.9 million adults). Southern Minnesota is part of a broad region stretching across the upper Midwest and Great Lakes that supports some of the highest breeding densities of the American Goldfinch in North America (Figure 1). Along BBS routes in Minnesota, observers reported an average of 15 birds per route per year. Further east, in the lower Great Lakes region and St. Lawrence Plain, an average of 33 goldfinches was detected on BBS routes (Sauer et al. 2017). Reported densities of breeding pairs in the field are few and are complicated in part by the bird’s inclination to nest semicolonially. At least one study reported less tolerance of nearby goldfinch neighbors early in the nesting season, when nests are not tolerated closer than 21 m, and considerably more tolerance late in the season, when nests may be as close as 3 m (Lewis 1952). When a female determines that a neighbor’s nest is too close, she tears out the lining of the neighbor’ s completed nest. The few studies that report nesting densities provide estimates that range from 12 to 14 nests per ha in Illinois and New York, respectively (Dhondt et al. 2007), to as low as 0.78 pairs per ha in Ontario (Miller 1978). In Minnesota’s forested landscape, where densities are expected to be significantly lower than in more southern and western counties, an average of 1.5 pairs per 40 ha were detected in the Chippewa National Forest, and an average of 0.5 pairs per 40 ha were detected in the Superior National Forest (Niemi et al. 2016). Although it was not one of the top 20 birds in any of the sampled habitats in either forest, the American Goldfinch was the most common member of the finch family in the Chippewa National Forest. In the Superior National Forest, it was nearly tied in abundance with the Purple Finch (Niemi et al. 2016). Across southern Canada and the United States, the American Goldfinch has shown a very slow but statistically significant population decline that averaged 0.17% per year from 1966 to 2015 (Sauer et al 2017). By contrast, in Minnesota the population has demonstrated a steady and significant increase, averaging 0.87% per year since 1966 (Figure 7). Populations in the Chippewa National Forest also demonstrated a significant increase from 1995 to 2016. Although the trend line was not significant in the Superior National Forest, the combined regional trend was significant and increasing at 3.53% per year (Figure 8). Factors that influence populations are variable. Overall, the species benefits from habitat changes that create open woodlands and fields. During the breeding season, predation is the most important factor impacting reproductive success, but mortality is believed to be highest during the winter (McGraw and Middleton 2009). 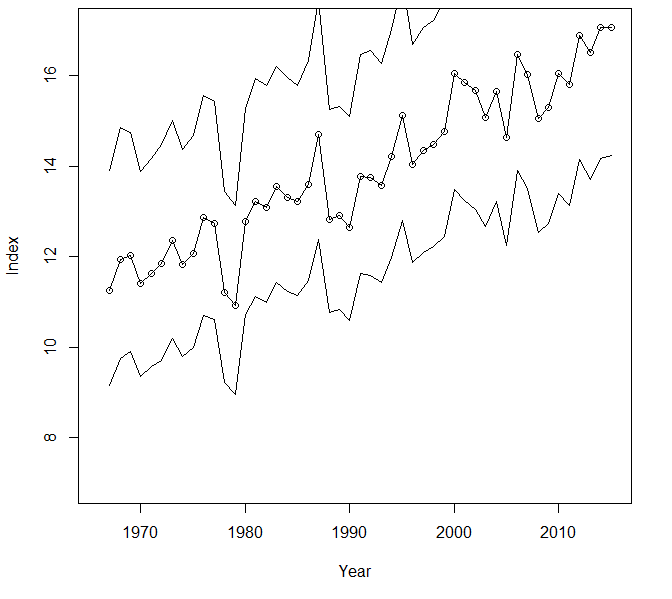 Breeding population trend for the American Goldfinch in Minnesota for 1967–2015 based on the federal Breeding Bird Survey (Sauer et al 2017). 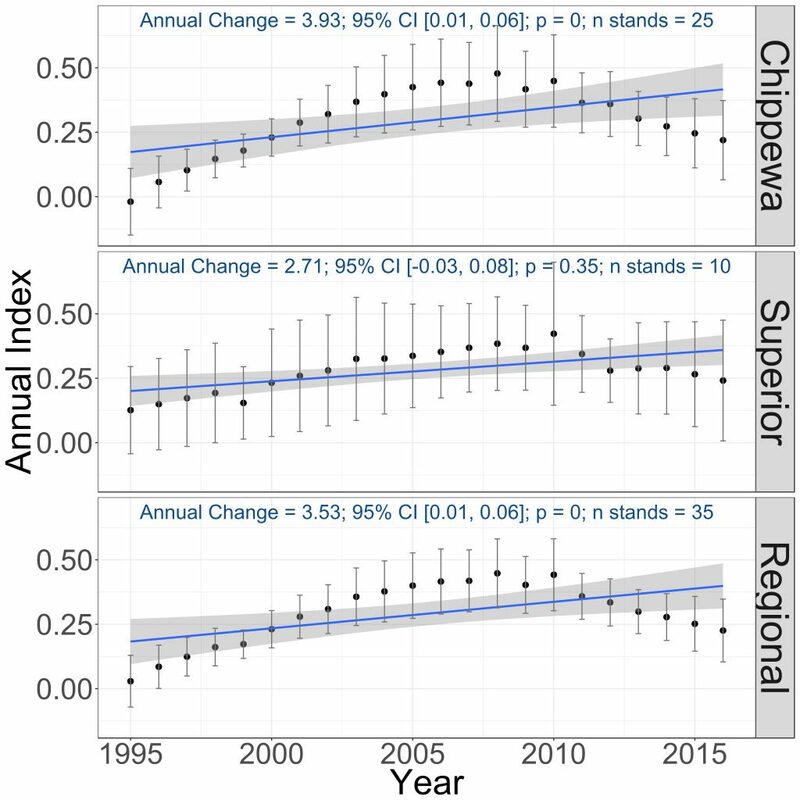 Breeding population trends of the American Goldfinch in the Chippewa and Superior National Forests and the combined regional trend, 1995–2016 (Bednar et al. 2016). Although the species has experienced a small decline over the years, it remains a widely distributed and abundant species. Unlike many species, climate change is not expected to create major challenges for the goldfinch; its vulnerability to warming temperatures has been rated as low (North American Bird Conservation Initiative 2010). The goldfinch, a species that benefits from low-intensity development, has been assigned a low continental concern score of 7/20 (Rosenberg et al. 2016). Described by many early naturalists as a joyful, high-spirited bird, this popular backyard bird is destined to delight Minnesota nature observers for many years to come. Bent, Arthur Cleveland. 1968. Life Histories of North American Cardinals, Grosbeaks, Buntings, Towhees, Finches, Sparrows and Allies (Order Passeriformes). Parts I, II, and III. Smithsonian Institution Bulletin 237. Washington, DC: U.S. National Museum. Dhondt, André A., Peter H. Wrege, Jacqueline Cerretani, and Keila V. Sydenstricker. 2007. “Avian Species Richness and Reproduction in Short-Rotation Coppice Habitats in Central and Western New York.” Bird Study 54: 12–22. Lewis, Hubert. 1952. “Thistle-Nesting Goldfinches.” Flicker 24: 105–110. Miller, Linda J. 1978. “The Spatial and Temporal Dispersion of Nests as an Adaptation to Food Exploitation and Nest Predation in the American Goldfinch.” PhD diss., University of Illinois, Urbana-Champaign. Pius, B. 1948. “Goldfinches in St. Paul.” Flicker 20: 47–51.